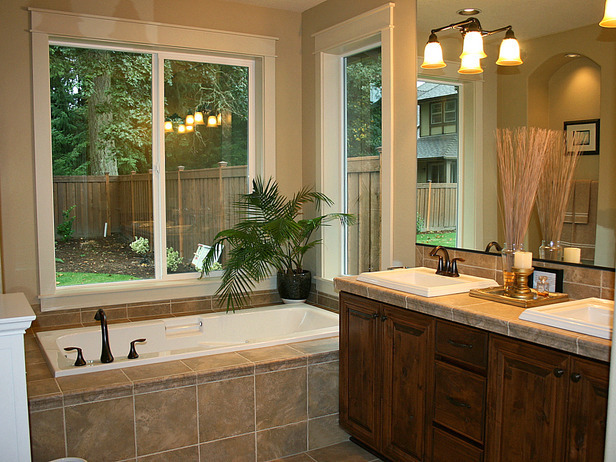 You can justify remodeling your bathroom(s) because it is one of the best ways to increase your home’s value! And if you get it done before you put your home up for sale, (if ever), you can enjoy the fruits of your investment and /or labor. 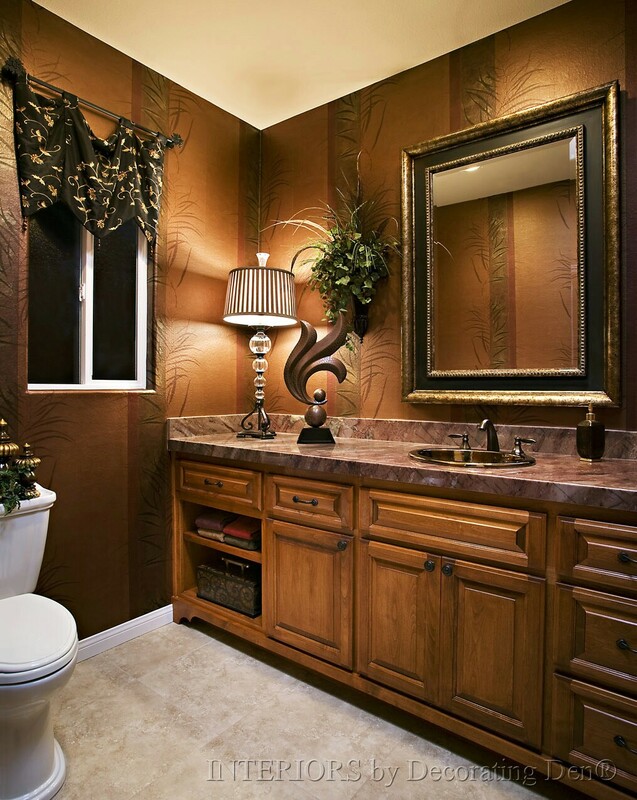 Bathroom design has recently been somewhat more modest after we quit experiencing the rapid appreciation in home values during 1995 – 2005 . According to the latest Home Design Trends Survey (HDTS) from the American Institute of Architects (AIA), more homeowners are choosing to remodel and renovate, rather than move into a bigger house or install fancy appliances. People are now moving away from glitzy features such as steam showers and towel warming drawers/racks, and instead looking for energy-efficient/greener options such as water-saving toilets, radiant heated flooring and LED lighting options. In: Luxury is going to the showers and vertical spa systems, i.e. 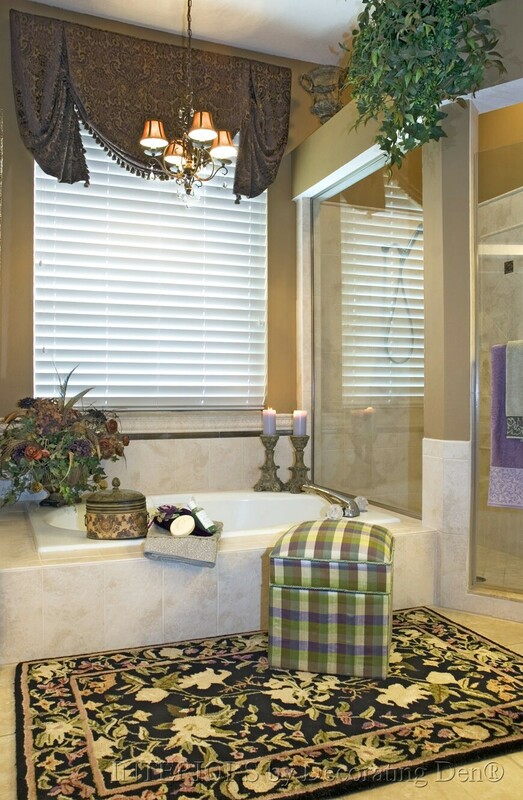 custom shower systems. In: Water conservation thru shower heads: Moen and Envi are two such brands. Don’t replace a yucky shower door: Just scour it. Instead of replacing grimy glass shower door, clean it with a mixture of one part muriatic acid and about 10 parts water. Scrub with steel wool. After wiping it down, reinstall the door. Grimy bathroom walls: An easy way to get rid of surface mold: Mix a spray bottle with one part water and one part bleach. Just spray it on the wall, and watch the mold disappear. 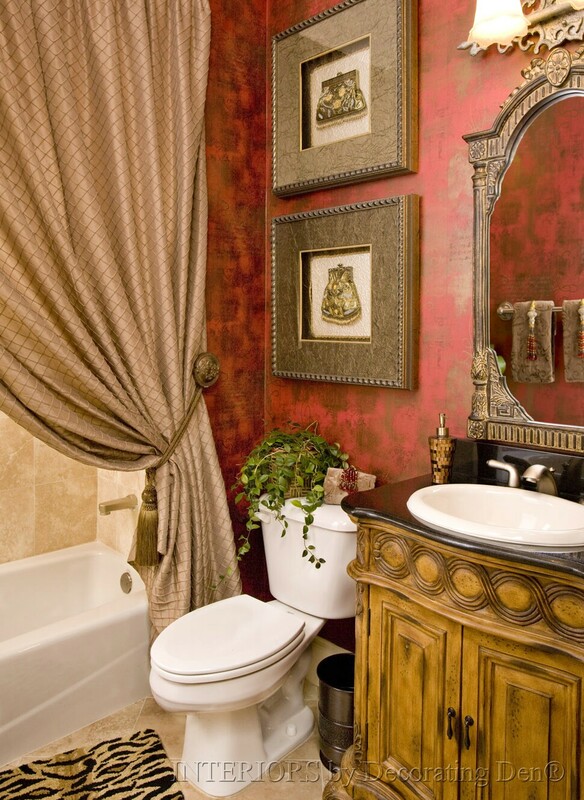 Give it a fresh coat of paint, and your grimy bathroom will go from red flag to red-hot. This also helps clean up shower grout. 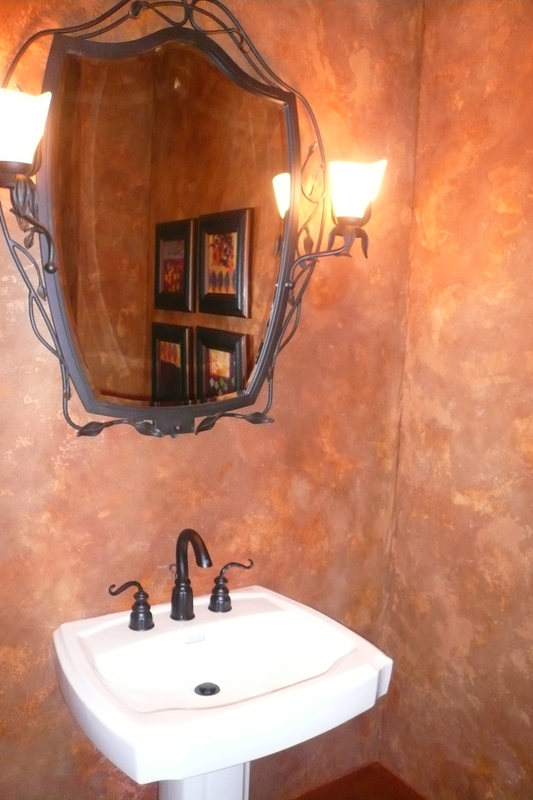 Avoid dated tile by painting: A low-cost alternative to replacing the tile is to use paint. First coat the tiles with a high-adhesion primer. Next, brush on a special ceramic epoxy covering. 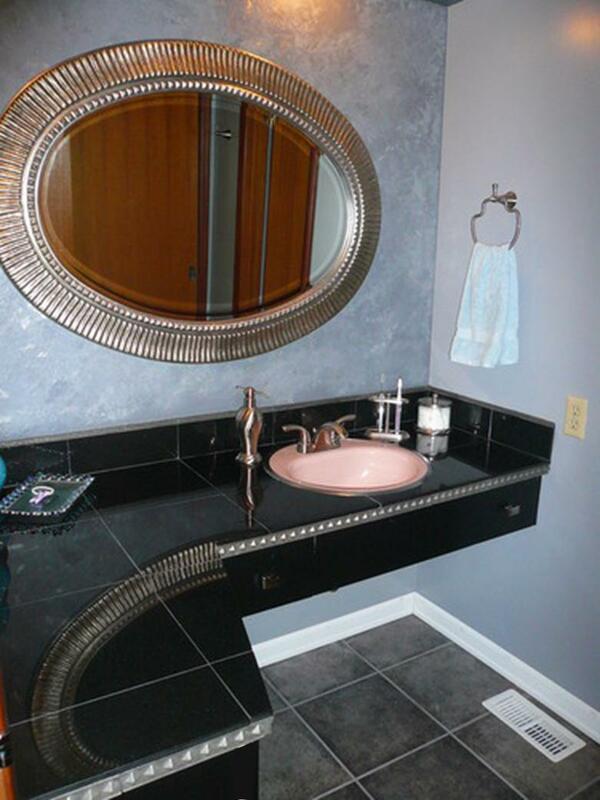 For a fraction of the cost of new tile, you will have a new look and an up-to-date bathroom! 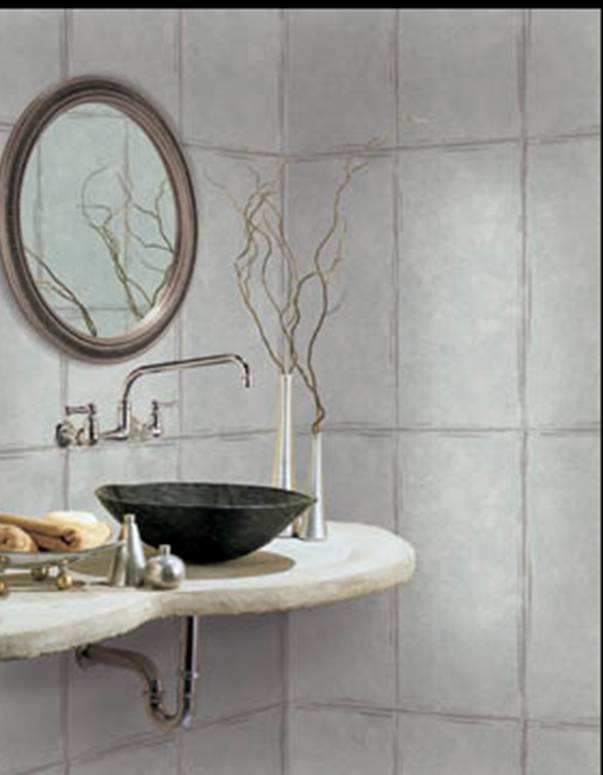 – Mix small quantities of the fancy tiles in with the less expensive tiles for a custom, high-end look. – Create a creative accent wall with tile by adding a vertical column running up the wall in the more extensive accent tile, and surround it with standard tile. 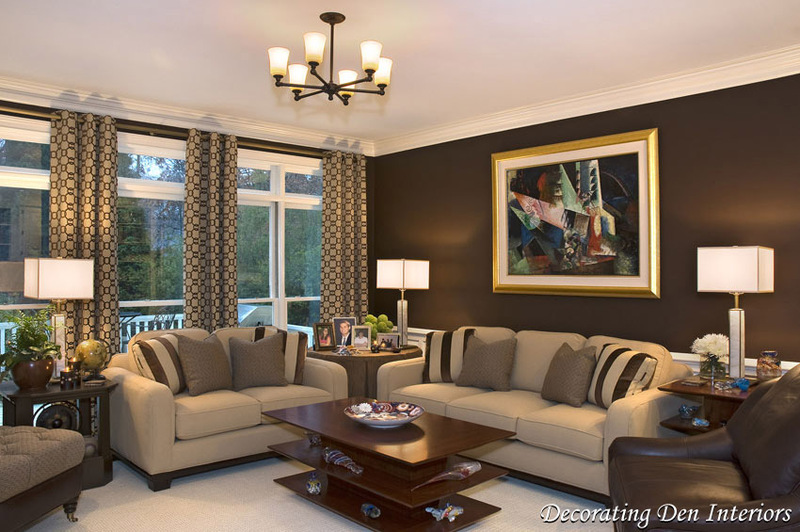 The vertical column will create drama and make your ceiling look taller. Here’s a great tip– Joint compound holds up to moisture well for texturing a wall, while you can’t use faux wall texture products in moisture areas. The wall above has 3 shades of gray and dabs of metallic silver applied with a sea sponge roller, and small pieces of sea sponge, then blended with a thick roller brush. On the counter, inexpensive black granite tiles were applied over the old laminate countertop, and stock trim from Lowes was used on the edges. Add a new faucet and suddenly the vintage 1950’s pink sink looks cool again! 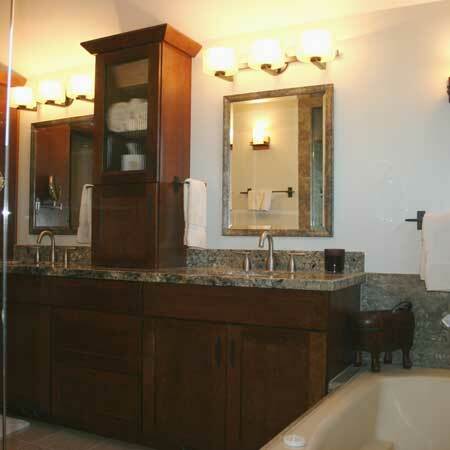 Bath Fixtures: Shop around on Ebay and Craig’s list, as these can get expensive. While it can be risky to do plumbing work yourself, it’s not a big deal to replace faucets on your own. 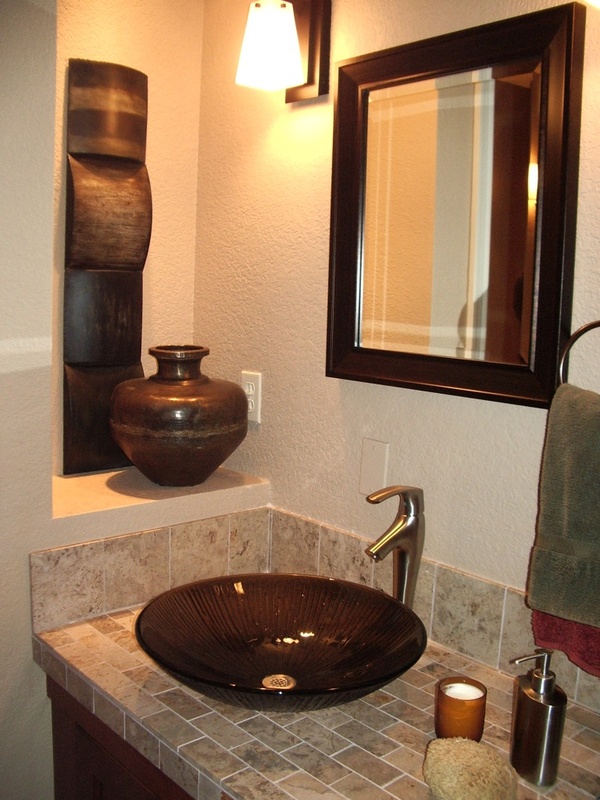 This is a great way to update a sink area… not to be overlooked! Tips & instructions for replacing a faucet. 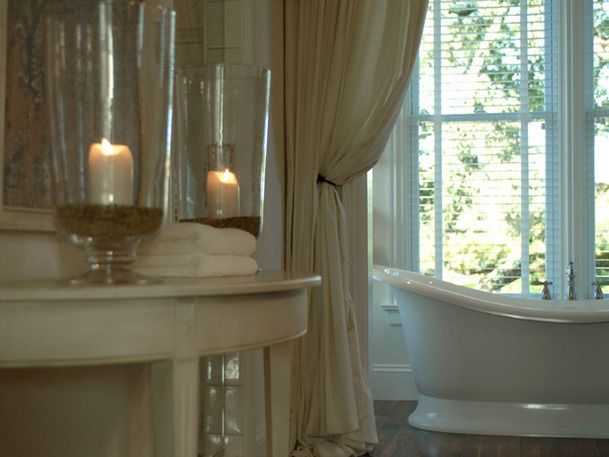 Accessories are a great place to shave costs by shopping for bargains, so you can save the big bucks to splurge on items that will have a bigger impact, such as a Jacuzzi tub. Ahhh, these accessories add a luxurious, tropical feel without spending an arm and a leg…. 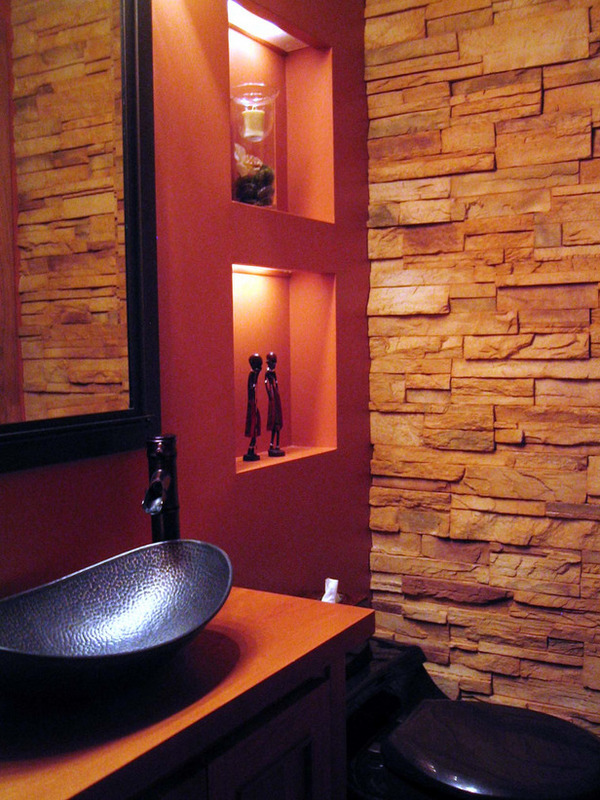 Ask the stone and solid surface suppliers for remnants of stone. 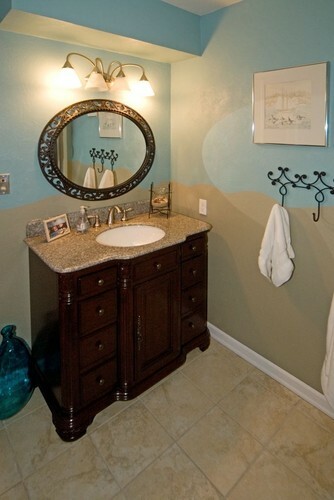 This is a great way to afford a beautiful stone solid surface countertop. Tile is actually very affordable and an excellent way to upgrade the look of the bath by using it for bathtub shower surrounds, floors, walls, and countertops. It’s the labor that can really add up. So if you learn to do this on your own, you can have a great look at a very reasonable price! Install tile over laminate: I have had this done on several countertops and it works great if done right… Here are directions to do it yourself. 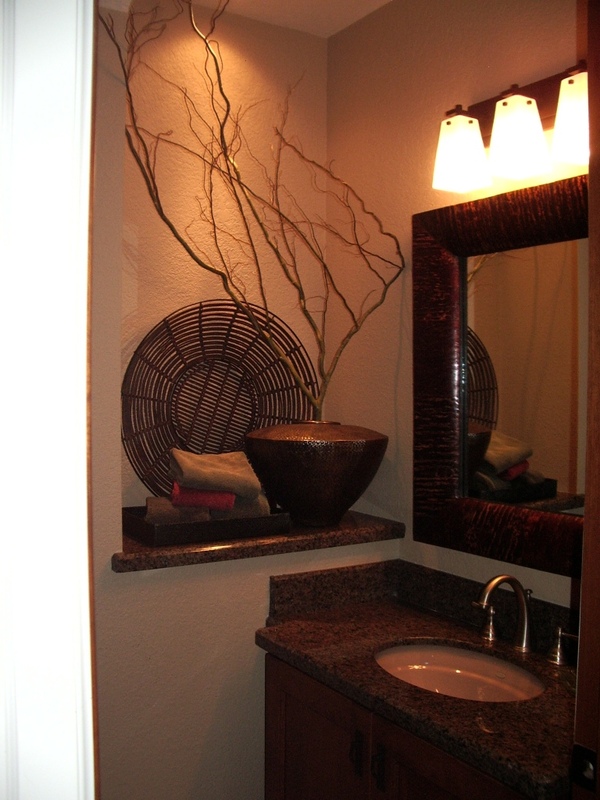 A soapstone top, with its river rock color and matte finish, has a warmer look than polished granite. 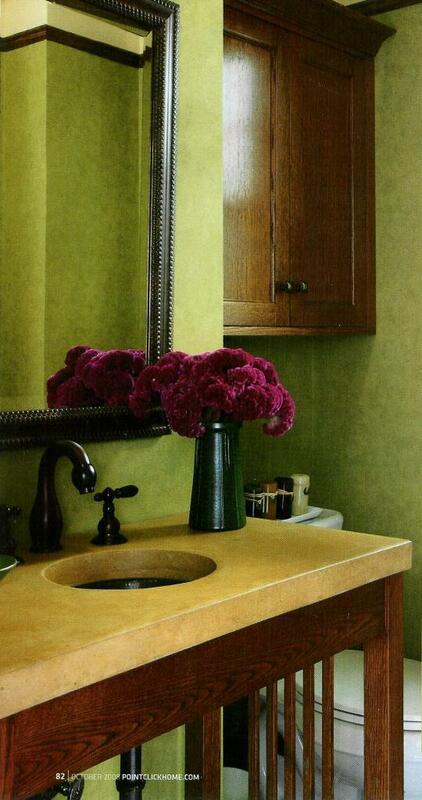 You can get the look of a solid surface countertop without relying on a fabricator to cut and install. You can cut to your specs using woodworking tools. Slabs start at about $25 per square foot. 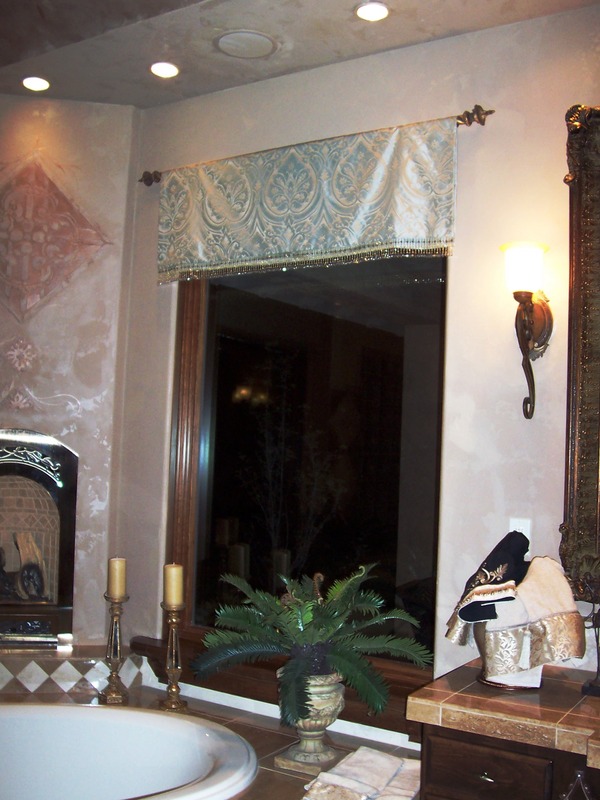 Window treatments: Don’t skimp by leaving out window treatments. 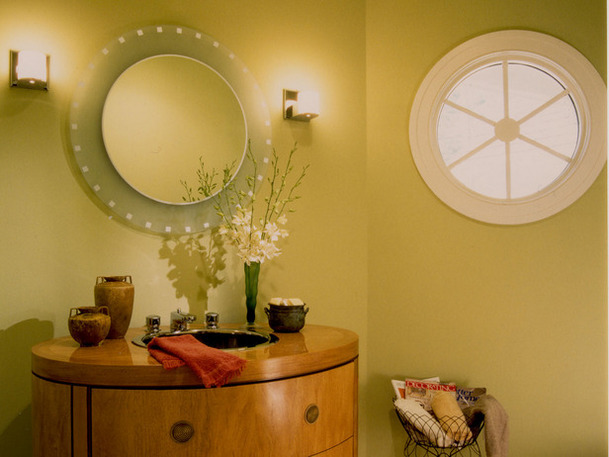 Your options are endless in a powder room, but in rooms with showers and baths, make sure they’re washable or dry cleanable. 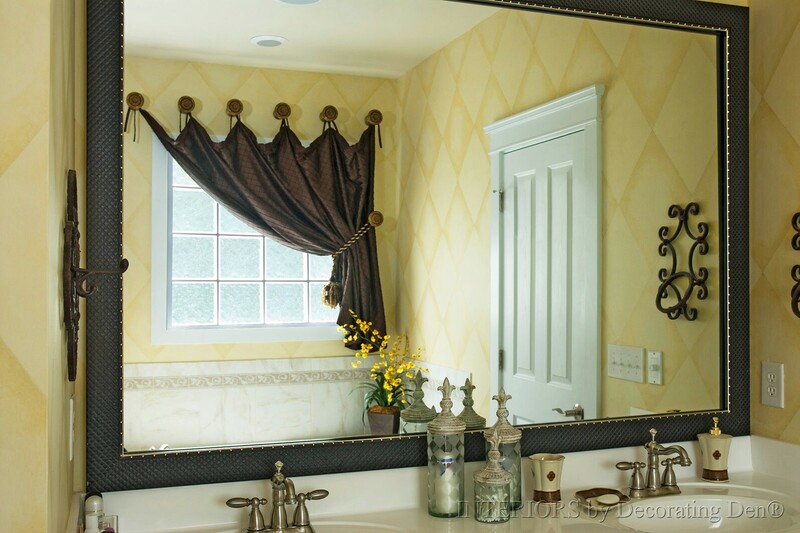 You don’t need to spend a lot on your window treatments. Notice how simple the above treatments are, while still adding impact. For shades and blinds, you want to make sure they hold up to moisture as well. Faux wood blinds are great, such as Hunter Douglas Palm Beach™ polysatin shutters or EverWood® X-tra blinds …These products are made from materials that are guaranteed to never warp, chip, crack or fade even in the most extreme temperatures. They are ultra easy to clean as well. 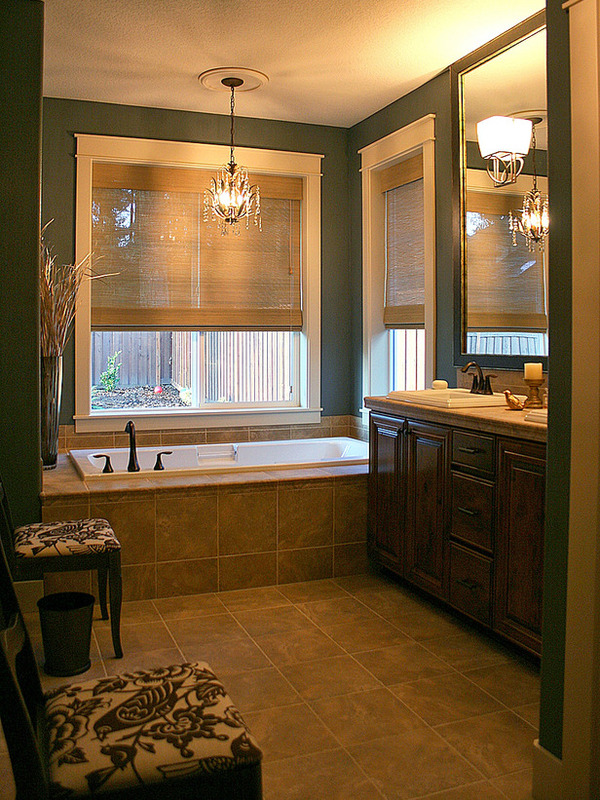 Above: This bath didn’t need a remodel, but notice the big difference the window coverings and change in lighting made! – Easier and less expensive than you may think… Many inexpensive options can be found at Lowes, Home Depot or spray paint your existing fixture…. 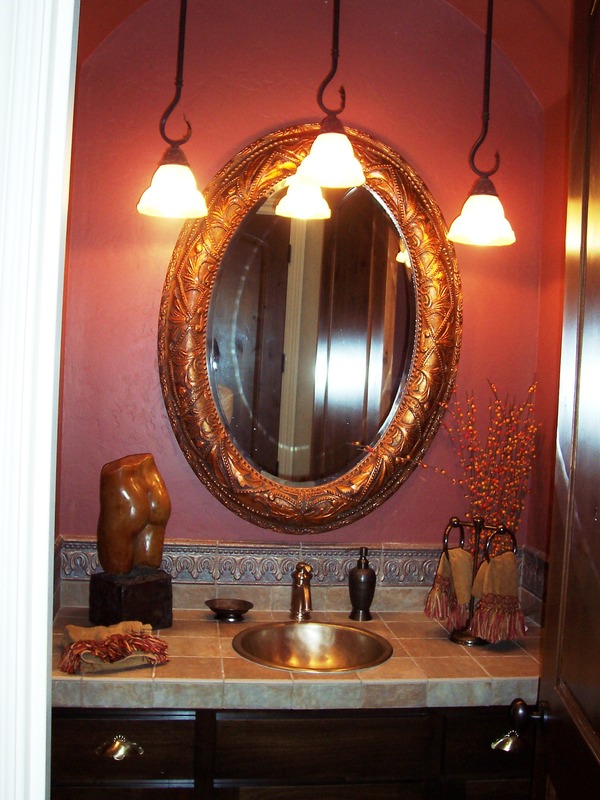 This is an excellent area to work on because updating your light fixtures can really make a big difference! 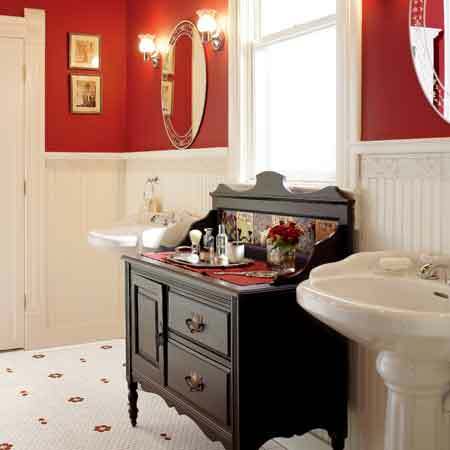 Set between matching pedestal sinks, a tiled-back washstand creates a his-and-hers vanity for a lot less coin than a new dresser-style model. 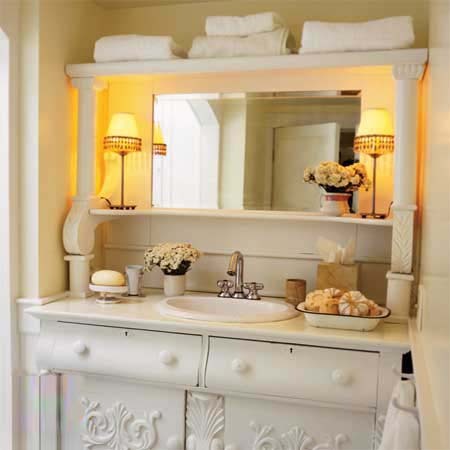 Expect to pay about $250 for a similar washstand at antiques or thrift shops. 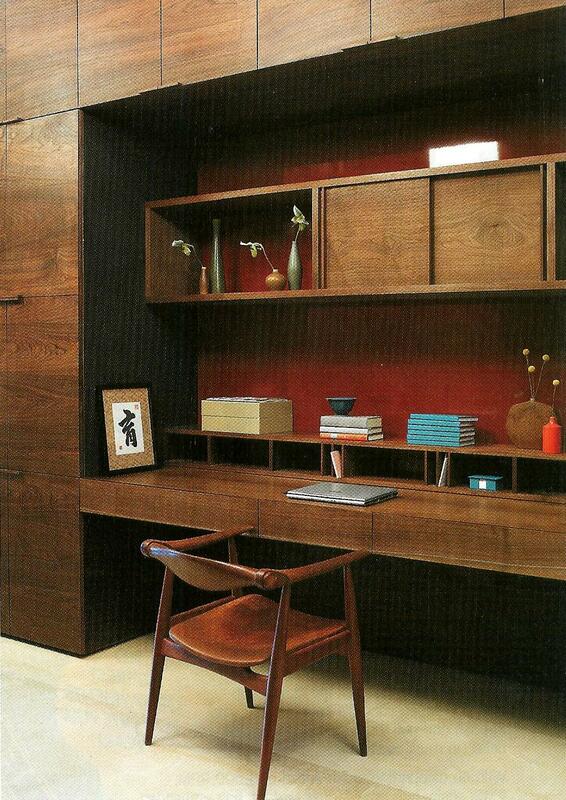 Sideboard vanity: A mirrored dining room buffet replaces both a run-of-the-mill medicine chest and a sink cabinet. 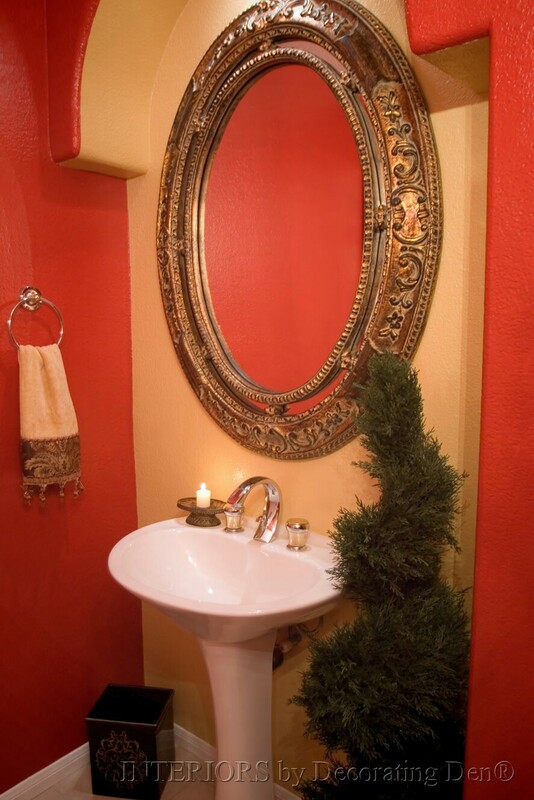 Paint it the same color as the walls to give it a built-in look. 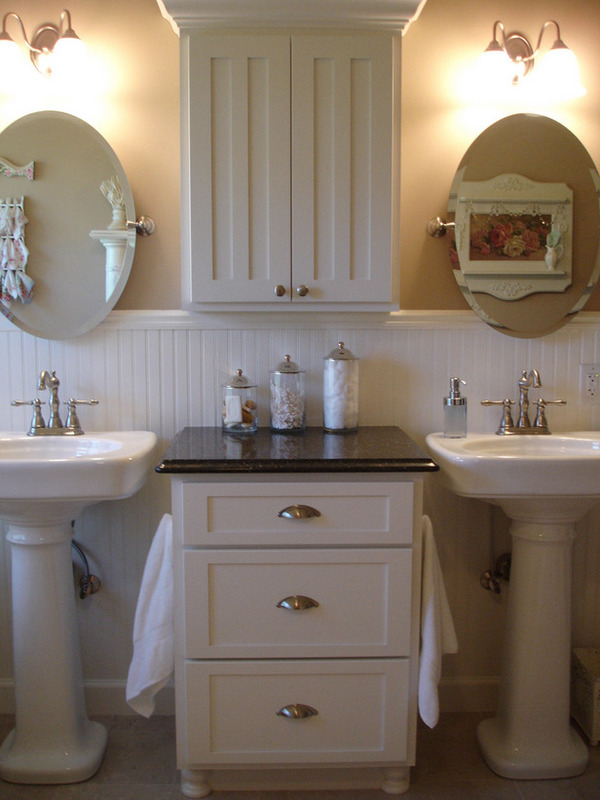 Find a buffet for your bath at flea markets for about $400. 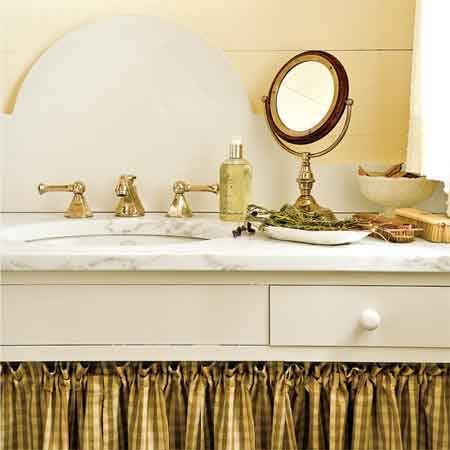 Simple skirted sink: A gingham curtain hides exposed plumbing, and punches up a white and cream color scheme. No it is not a hobby… just a supplement to my interior decorating, window treatment and furnishings biz in Portland, OR, USA: http://www.DecDens.com/raganc . Glad you like it though! Good tips, good tips. All is good. 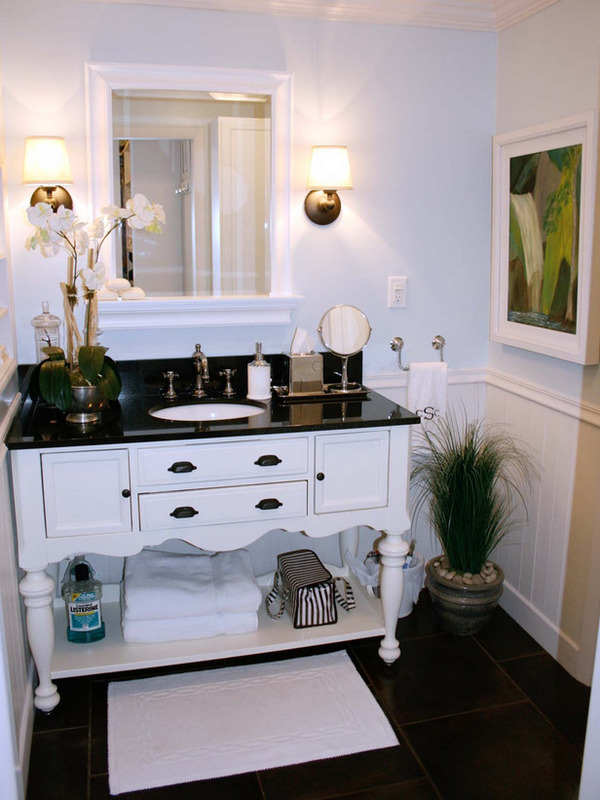 I love the photo of (This old house) i think that the design is vintage and modern at the same time .The him and her sinks look very beautiful together and the dark wood makes the bathroom come to life . I also really like how the mirror trim is the same as the units Beautiful . Yes I agree. It’s a beautiful bath design. Thank you for very informative post of yours. You have explained everything well. I appreciate that you shared this to us. 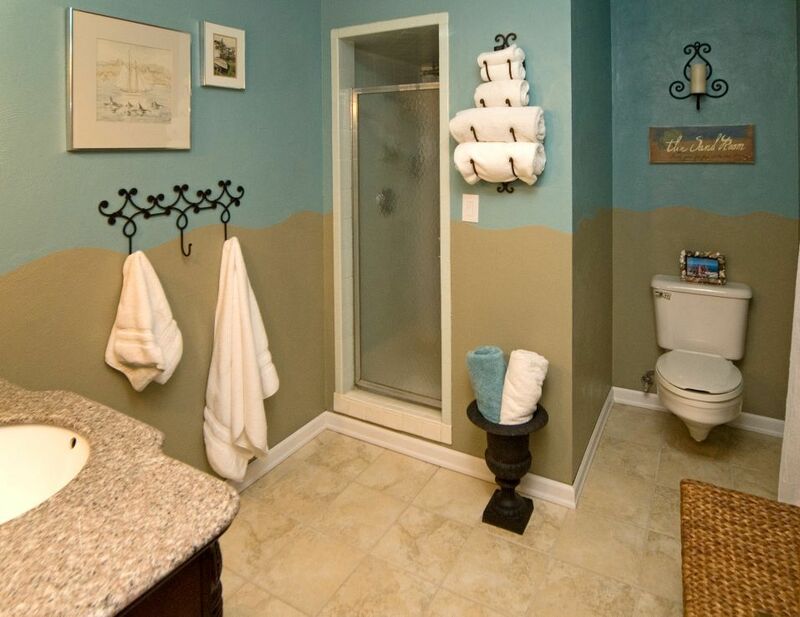 That’s a lot of bathroom designs. 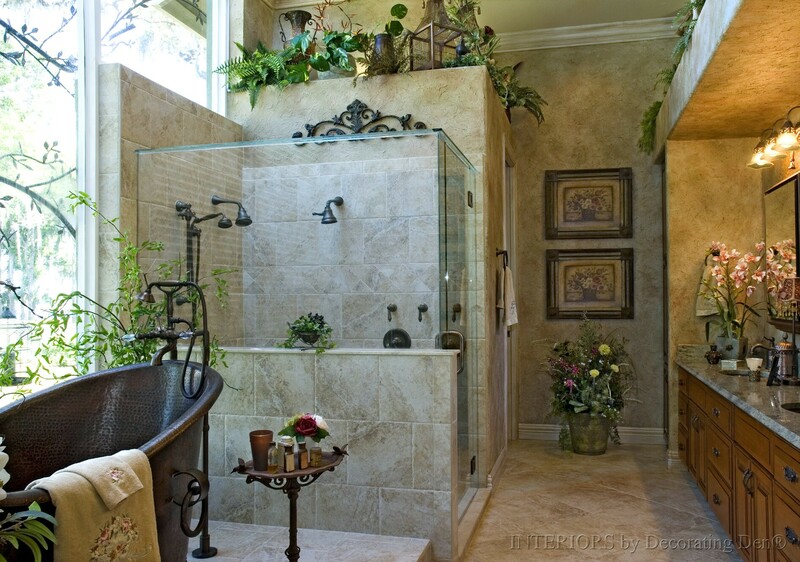 I like the one with the circular bath, makes the area more spacious. Thank you for your feedback. If you’re referring to the free-standing oval tub, yes they definitely don’t take up as much as space as the big, built-in tubs. Every single details are becoming modern including the style of faucet which makes an attractive appeal because of it’s style and unique design.Truly that most of homeowners are becoming decorative in terms of beautifying their bathroom place. Simply wish to say your article is as amazing. The clarity in your post is simply great and i can assume you are an expert on this subject. Well with your permission allow me to grab your feed to keep updated with forthcoming post. Thanks a million and please carry on the enjoyable work.